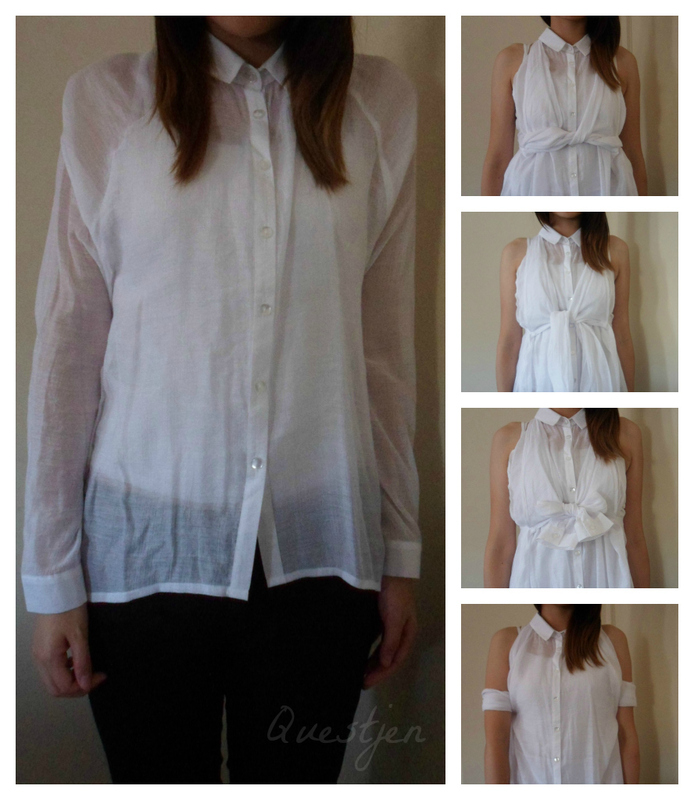 I bought this white chiffon cut-out blouse from YesStyle made from the Korean brand prischu essentials. It's really casual and quite versatile as you can pair it with pretty much anything (pants, skirt and more). These days I'm liking collared tops - I think they're so cute yet classy! As the back is cut-out, I decided to experiment a bit with the sleeves just for fun. I don't intend to wear it out differently but I thought it'd be interesting to share the ways you could potentially wear this shirt to make it look different to how it is usually worn. Mind you, I did iron the blouse beforehand but it got crinkly again. Chiffon, Y U do this to me?! 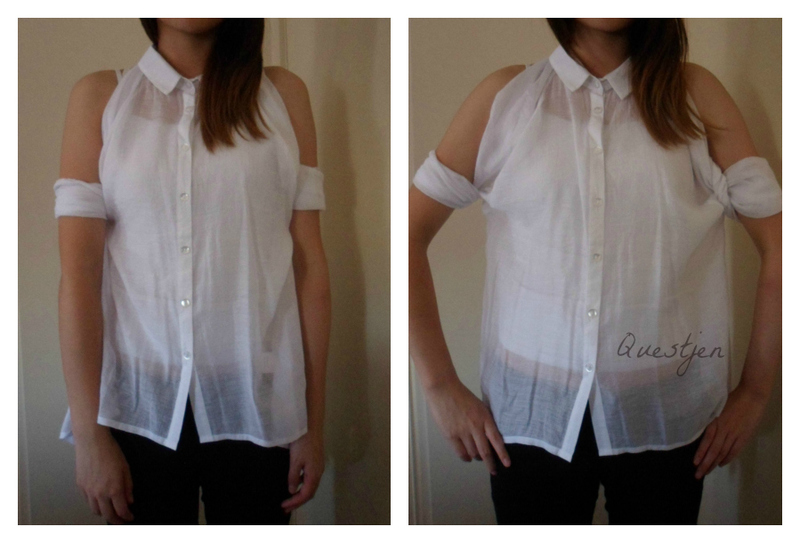 Are there any other ways of wearing a cut-out blouse?? It's cool how you can instantly change something long-sleeved into something short-sleeved. Taking outfit shots is troublesome without a tripod, as you may have seen in my 365 challenge photo. Boxes surely come in handy though. A way to accessorise your blouse besides wearing jewellery is to wear... a bow tie! I've made a poll and I'd love to see your reasons why or why not in the comments below! Hope everyone's having a great day/afternoon/night and Happy Lunar New Year :D Yay Sunday! omg, wow! Jen, this is so cute *w* I love the idea!! the shirt is lovely and these are cute ideas! 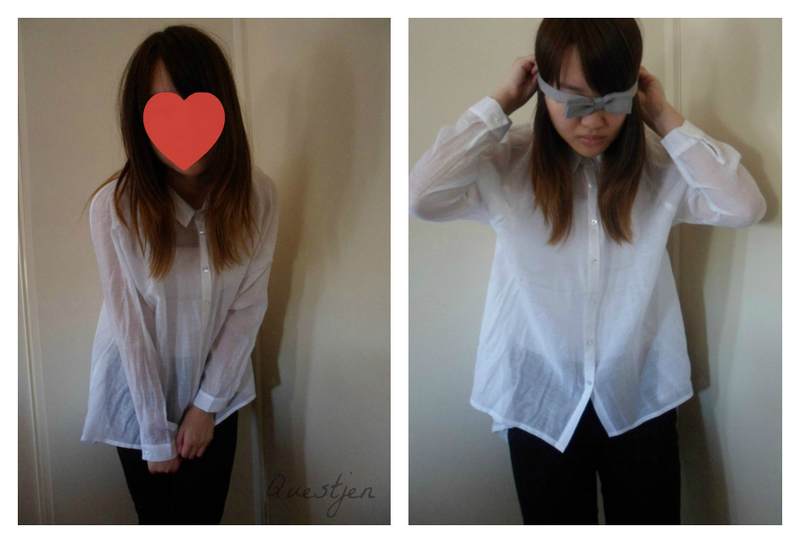 ^^ I love oversized shirts! Yeahhhh >_< But it is a pretty, delicate fabric! haha, its so cute that u can play around with the blouse! i just randomly dropped by! lots of greets to australiaaaaaa from europe :))) hihi! Hehe ^_^ Oh lol yeah, I got the name from the Yesstyle site but other than that I hadn't heard a name for these types of blouses xD So I completely understand!